I usually go to work in the afternoon, so I make lunch for my husband and myself before I go. Sometimes I make a different lunch menu for each other - like pancakes and eggs, salad for my husband, for me soba or udon noodle or rice bowl something like that. The other day, I made Oroshi-Soba. Oroshi is grated Daikon Radish. I enjoy the flavor the tangy sauce makes on the cold soba noodle. I also use watercress, thin sliced lunch meat, and a lot of shredded seaweed on it. This Soba noodle is the one that my mother sent me from Japan the other day, and also is known as one of the local favorite soba restaurant's! Oh, I hadn't eaten that for a while! Thank you mother!! 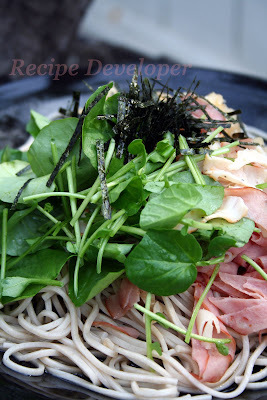 I was a little hesitated to put lunch meat on the top of soba, but it worked out very well and tasted fairly good! I used a ready to use Soba-Tsuyu (sauce), grated Daikon radish and mixed into the sauce, then poured over the noodle.